Who remembers the Jack Nicklaus Signature Series Lincoln Town Car? Or maybe the Oleg Cassini AMC Matador? They're both members of the elite club of Signature Series cars — cars tailor-made to the exacting ideals of certain exceptional individuals. And I have some ideas. I should clarify: I have some terrible ideas. There's something about this strangely personal class of car that makes me want to see some really perverse match-ups. I mean, Jack Nicklaus I guess made sense for the golf-watching geriatric Town Car buying crowd, but Oleg Cassini always struck me as odd. Which got me thinking. I wonder what the most wrong Signature Series vehicles might be? I came up with five proposed new Signature Series vehicles, and I'm trying for that special mix of not-quite-enough star power, just the right vehicle to be the right level of wrong. It's tricky, but I think I have some that could work. Anyway, to automakers and celebrities — feel free to start negotiations immediately. Oliver Platt Signature Series Veloster: Non-Turbo engine (but grille from Turbo), special corduroy upholstery, signature decals on dash and tailgate. Dianne Weist Signature Series Wrangler: Full off-road prepped with skid plates, reinforced suspension parts, and aggressive tires. "Go Weist" decals on hood and embroidered in neoprene seat covers. Also includes Diane Weist-autographed hunting knife in special dash holder. Malcom Gladwell Signature Series Cube: Signature decals on dash and rear bumper; also includes every Malcom Gladwell audiobook on special USB flash drive hard-wired into the audio system. 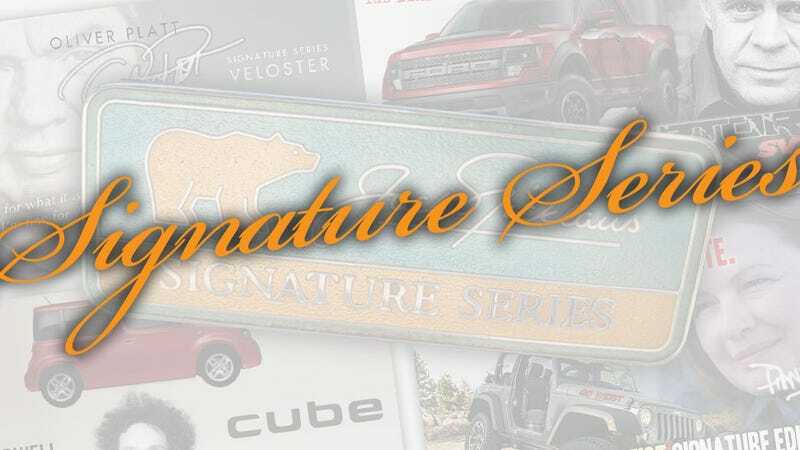 William H. Macy Signature Series Raptor: Includes William H Macy custom door graphics, improved intake manifold to bring 6.2L V8 to 625 HP, and denim seat inserts. Full DVD Bill Macy Filmography included in specially-designed steel toolbox in truck bed. Marina_Abramović Signature Series ForTwo: Interior upholstery includes fragments of dresses worn during The Artist Is Present performances, speedometer graphic includes image of Abromovic staring at driver.